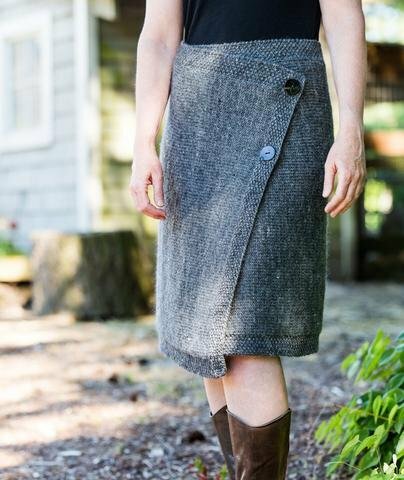 Size(s): To fit hips: 33 (36, 39, 42, 45, 48, 51, 54)"
Knit from side to side in one piece and shaped with short-row ‘darts’ at the hip, this simple skirt will become a wardrobe staple. It’s easy to adjust—all you have to do is shift the buttons! Diagonally placed buttons close the skirt with an asymmetric overlap for a flattering A-line. Or place the top button at the waist for a narrower line. You can knit it to two classic lengths—your skirt can sweetly skim your knees or brush your calves. We recommend choosing a 100% wool or wool blend yarn with good body and memory.